For the tests I'm inserting all 1048576 rows from the staging table. That's enough to fill exactly one compressed rowgroup as long as it doesn't get trimmed for some reason. SQL Server Execution Times: CPU time = 359 ms, elapsed time = 364 ms.
SQL Server Execution Times: CPU time = 32062 ms, elapsed time = 32511 ms. If you want to run tests yourself feel free to modify the test code that I wrote here. Why does the insert for ID % 16000 take so much longer than the insert for ID % 17000? In many respects, this is expected behaviour. Any set of compression routines will have widely ranging performance depending on input data distribution. We expect to trade data loading speed for storage size and runtime querying performance. Typically, data will be value or dictionary encoded, then RLE or bit-packing will be applied (or a hybrid of RLE and bit-packing used on different subsections of the segment data). The process of deciding which techniques to apply can involve generating a histogram to help determine how maximum bit savings can be achieved. The most expensive processing occurs for values that appear at least 64 times in the segment. This is a heuristic to determine when pure RLE is likely to be beneficial. The faster cases result in impure storage e.g. a bit-packed representation, with a larger final storage size. In the hybrid cases, values with 64 or more repetitions are RLE encoded, and the remainder are bit-packed. The longest duration occurs when the maximum number of distinct values with 64 repetitions appear in the largest possible segment i.e. 1,048,576 rows with 16,384 sets of values with 64 entries each. Inspection of the code reveals a hard-coded time limit for the expensive processing. This can be configured in other VertiPaq implementations e.g. SSAS, but not in SQL Server as far as I can tell. Some insight into the final storage arrangement can be acquired using the undocumented DBCC CSINDEX command. This shows the RLE header and array entries, any bookmarks into the RLE data, and a brief summary of the bit-pack data (if any). I can't say exactly why this behavior is occurring but I believe I've developed a good model of the behavior via brute force testing. The following conclusions only apply when loading data into a single column and with integers that are very well distributed. We can see that the rowgroup segment size grows at a linear rate and uses a small amount of CPU up until around 1 M rows. At that point the rowgroup size dramatically decreases and CPU usage dramatically increases. It would appear that we pay a heavy price in CPU for that compression. When inserting less than 1024000 rows I ended up with an open rowgroup in the CCI. However, forcing compression using REORGANIZE or REBUILD did not have an effect on the size. As an aside, I found it interesting that when I used a variable for TOP I ended up with an open rowgroup but with RECOMPILE I ended up with a closed rowgroup. Up until a mod value of 1600 the rowgroup segment size increases linearly by 80 bytes for each additional 10 unique values. It's an interesting coincidence that a BIGINT traditionally takes up 8 bytes and the segment size increases by 8 bytes for each additional unique value. Past a mod value of 1600 the segment size increases rapidly until it stabilizes. It looks like when the inserted number of rows < ~64 * the number of unique values we see relatively poor compression (2 bytes per row for mod <= 65000) and low, linear CPU usage. When the inserted number of rows > ~64 * the number of unique values we see much better compression and higher, still linear CPU usage. There's a transition between the two states which isn't easy for me to model but it can be seen in the graph. It doesn't appear to be true that we see the maximum CPU usage when inserting exactly 64 rows for each unique value. 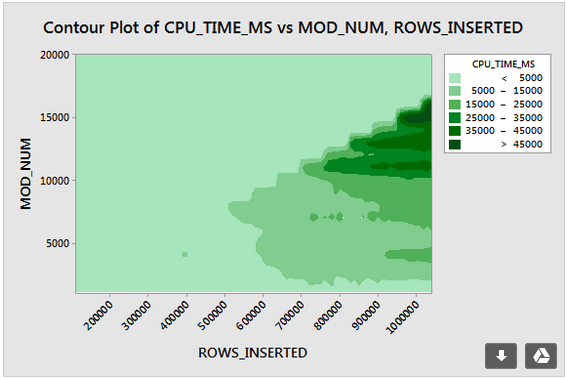 Rather, we can only insert a maximum of 1048576 rows into a rowgroup and we see much higher CPU usage and compression once there are more than 64 rows per unique value. It seems like there are at least two different compression algorithms at work here. Given the above, it makes sense that we would see the maximum CPU usage when inserting 1048576 rows. It also makes sense that we see the most CPU usage at that point when inserting around 16000 rows. 1048576 / 64 = 16384. I uploaded all of my raw data here in case someone wants to analyze it. It's worth mentioning what happens with parallel plans. I only observed this behavior with evenly distributed values. When doing a parallel insert there's often an element of randomness and threads are usually unbalanced. Choosing an odd number for the modulus is important here. SQL Server scans the staging table in serial, calculates the row number, then uses round robin distribution to put the rows on parallel threads. That means that we'll end up with perfectly balanced threads. In conclusion, when inserting evenly distributed integers you can see very high compression when each unique integer appears more than 64 times. This may be due to a different compression algorithm being used. There can be a high cost in CPU to achieve this compression. Small changes in the data can lead to dramatic differences in the size of the compressed rowgroup segment. I suspect that seeing the worst case (from a CPU perspective) will be uncommon in the wild, at least for this data set. It's even harder to see when doing parallel inserts. I believe, that this has to do with the internal optimisations of the compression for the single column tables, and the magic number of the 64 KB occupied by the dictionary. 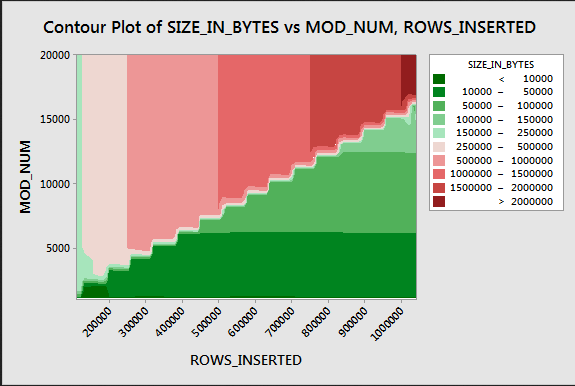 Example: if you run with MOD 16600, the final result of the Row Group size will be 1.683 MB, while running MOD 17000 will give you a Row Group with the size of 2.001 MB. For this scenario, the dictionary for the MOD 16000 will be bigger than for the first scenario with 1 column (0.63 vs 0.61). Not the answer you're looking for? Browse other questions tagged sql-server sql-server-2016 columnstore or ask your own question. Why does simple ALTER TABLE command take so long on table with full-text index? Why take full backups when you can do COPY_ONLY? Why does dropping foreign keys take long? What can cause DBCC CheckDB to take longer than usual?